1 Preheat oven to 220°C, 200°C fan oven. 2 Cut the potatoes into thin chips and toss them in oil and leave them to one side. 3 Separately, pour a small amount of oil into a roasting tray and heat in the tray in the oven for at least 10 minutes. 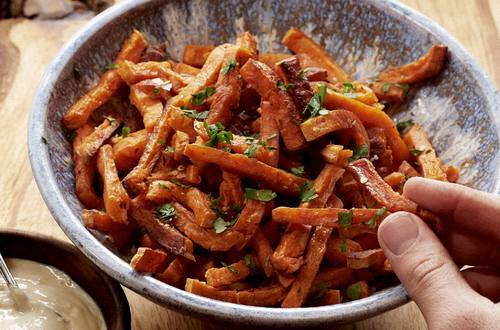 4 Place the sweet potato chips into the hot oil roasting tray and bake for 20-30 minutes until golden and crispy. 5 Carefully toss them together every 10 minutes to keep them even. 6 Drain on kitchen paper over a tray for 5 minutes. 7 Serve with dipping sauce. 8 Rest for 20 minutes and serve with the spicy white BBQ sauce.